Sister Mary Paul Hickey, a Pittsburgh Sister of Mercy for 80 years, died on Wednesday, January 16, 2019 at the Convent of Mercy in Oakland. Born in McKeesport, Pa., she was 97 years old. Daughter of John and Irene (Welsh) Hickey, Sister Mary Paul entered the Sisters of Mercy from St. Peter’s Parish, McKeesport in 1939 and made final vows in 1944. Sister Mary Paul earned a bachelor’s degree from Mount Mercy College (now Carlow University), a master’s in education administration from Duquesne University and a Ph.D. from Fordham University. A gifted educator of little children, she taught first and second grades at several diocesan schools, and at Our Lady of Mercy Academy. When the Academy moved to a new site in 1963, Sister Mary Paul founded The Campus School of Carlow University which today includes Preschool, Pre-K, Kindergarten and Montessori preschool, and grades 1-8, on the grounds of Carlow University. 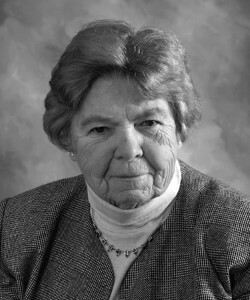 Additionally, she taught teachers as a lecturer, professor, and chair of the Department of Education at Carlow, introducing the Cadet program for Catholic School teachers and other innovative programs that helped to make Carlow a leader in education. In the 1980’s Sister Mary Paul moved to Memphis, TN where she served as executive director of St. Peter Home for Children, a residence for emotionally disturbed and delinquent boys and girls. She returned to Pittsburgh in 1988 and served in several positions at Carlow University, including director of residence, chair of the Child Care Center, and executive director of Children’s Programs, including The Campus School. After retirement in 2006, she volunteered as the alumni relations director for The Campus School. Most recently, she participated in the ministry of prayer, and maintained her connection to the school through her lunchtime conversation with its current leaders. Whatever she did, Sister Mary Paul brought intelligence, compassionate understanding, enthusiasm, and humor to her service. Her love for the education of children generated a unique, practical classroom approach such that the children she taught and teachers she formed do not forget her. “She was first of all a teacher with extraordinary management skills,” her brother Tom remarked. “As a teenager, she knew what she wanted to be and do, and she enjoyed 80 years of a life dedicated to others. She touched so many lives.” Preceded in death by her parents, brothers Reverend John P. Hickey, Paul S. Hickey and sister Loretta Nee, Sister Mary Paul is survived by a brother, Thomas J. Hickey, nieces, nephews and grand nieces and nephews. Friends will be received Friday, January 18 from 4 to 7 p.m. and Saturday, January 19 from 8-11 a.m. at the Convent of Mercy, 3333 Fifth Avenue followed by a funeral Mass Saturday at 11 a.m. in the Convent Chapel. Interment will be in St. Xavier’s Cemetery, Latrobe, Pa. Arrangements entrusted to the EDWARD P. KANAI FUNERAL HOME, 500 Greenfield Avenue. In lieu of flowers, donations may be made to the Sisters of Mercy, 3333 Fifth Ave., Pittsburgh, Pa. 15213, or to The Campus School of Carlow University, 3333 Fifth Ave., Pittsburgh, Pa. 15213.